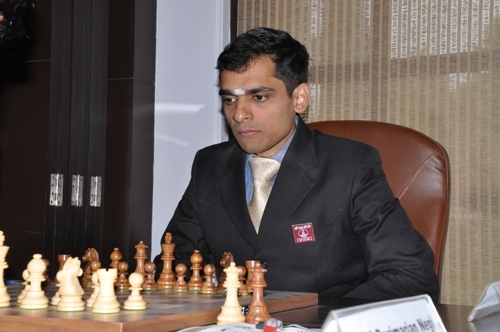 New Delhi, June 26: Krishnan Sasikiran scored a third successive win and in the process avenged his recent loss at the hands of Parimarjan Negi in the inaugural AAI Grandmasters Chess Championships that is now halfway through. In another game, Women’s World champion Hou Yifan got her first points through a draw against Filipino Wesley So in 52 moves. A little later the third game between Fabiano Caruana and Viktor Laznicka, which began in the Caro-Kann Advanced Variation, also ended in a draw in 59 moves. It was the first time a round had produced two draws. Overall only four games out of 15 have ended in draws in the first five days. Fabiano Caruana leads with four points while Laznicka is second with 3.5 points. 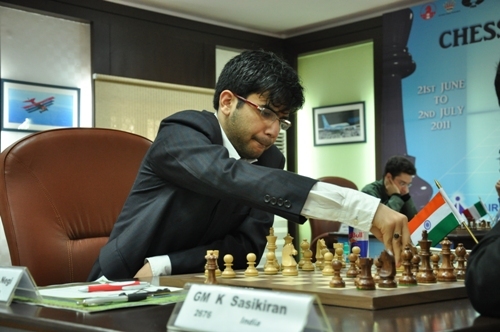 Sunday’s win with black for Sasikiran from a Ruy Lopez in 56 moves brought him to three points and that must seem a big relief after two losses at the start. Wesley So has 2.5 points, Negi 1.5 and Hou Yifan has half a point. Replay the games with computer analysis. Asked if he was relieved with three lout of five in the first half, Sasi said, “No doubt about that. It felt good to come back at fifty per cent after the two wins and now I am plus one,” said Sasi, who lost to Parimarjan Negi in the Dubai Open in April. Their earlier clash in the Asian Championships had ended in a draw. 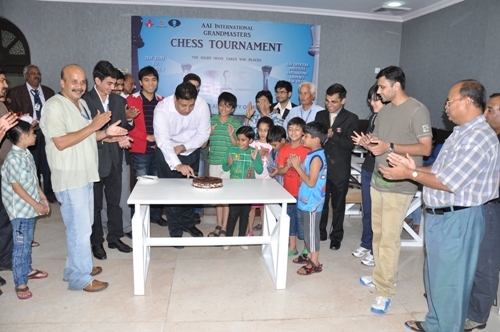 For both Sasikiran and Negi, the tournament has been bitter-sweet. 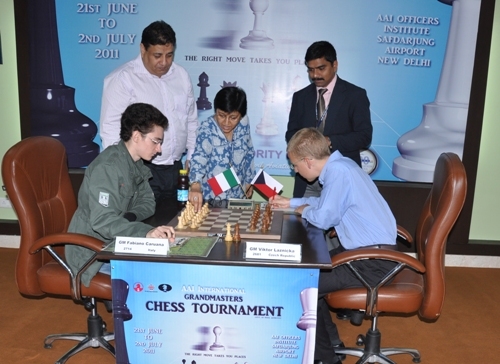 This game against Negi may well have been Sasi’s first in the past week without any serious error but Negi in most of his games in the ongoing tournament has begun well but has been found wanting in the middle game. On Sunday, in a Ruy Lopez Closed with Breyer Variation, Negi was again fine in the opening and in fact was actually better positionally. But once again he went awry in the middle game. This time, he attempted to go for Saskiran’s a6 pawn with Qe2 on the 29th and that may well have been the beginning of the end. Negi did make a fight of it, but Sasi hung onto his advantage to grab the full point. Wesley So, who had admitted to having mistakenly having got ready for Hou Yifan instead of Fabiano Caruana a day earlier, did not quite manage to grab a win from the Women’s World champion. It was Hou’s first draw after four losses. With a rest due for Monday, she will be hoping for a better second half of the tournament. Monday will be a rest day. The sixth round will be played at 2 pm on Tuesday.